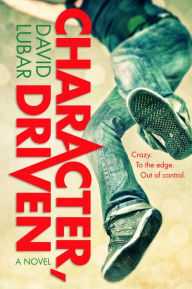 Told in a rambling and light-hearted way, Character, Driven is a story ostensibly about Cliff Sparks's misadventures in love (or, at the very least, his search for a girl who won't mind having Cliff touch her). And while the narrator is funny and the recollection often quite hilarious, there is an odd tension in this novel between that lightness and the series of grim events that are being recalled. The ending of the book (previews and forthshadowing aside) takes a particularly dark turn, but throughout there are actions (including suicide, assault, child abuse, infant and parental death, and drug trafficking) seemingly at odds with the humor that permeates the story. At its heart, the novel is an insightful look at boyhood. Lubar does a good job bringing in the usual tropes of horny adolescence, but adding some sensitivity to Cliff (and balancing it by giving the girls a chance to have some agency of their own). Likewise, Lubar does a decent job giving the adults a more nuanced depiction. However, when it comes to the character-driven nature of the book, this is all about Cliff, no matter what else goes on in the story. And given that Cliff ultimately turns out to be an unreliable narrator, we are left with the frustration of not being entirely sure what actually happened in the story. This makes it hard to really summarize the story. I enjoyed reading the book because it was funny (even if the subject matter suggests otherwise) and because I think Lubar (through Cliff's voice) made some wonderful observations, but I'm not really sure what it was all about.